Something I have been doing more of lately is knitting. 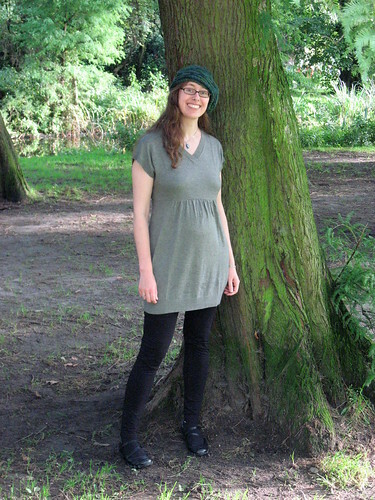 When we moved to Amsterdam I only brought my felt cloche winter hat, nothing knitted. I soon realised my mistake: mostly it's not that cold here and knitted hats can be shoved in a pocket or bag or sleeve. 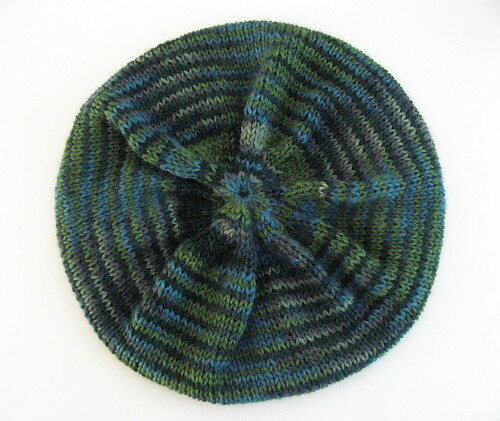 Our first few months were too busy to think about hat knitting much, but I did find a pattern on ravelry and filed it away. The other day I finally bought the appropriate needles, grabbed a ball of yarn from my stash (a lovely hand-dyed alpaca fibre) and knitted it shockingly quickly (for me at least). Just two days after I started it, I already have my hat. It's a gorgeous 22°C today, so I actually only wore the hat for the picture. It's a sort of floppy beret style, which is perfect for being able to fit over my hair when it's up in a bun. The hat did turn out a little looser than I expected, so I'll probably cast on fewer stitches next time I make this pattern. Here's my ravelry project page. The astute observers might notice a hint of another project on-the-go in the first picture. I expect to move on to the next stage of that project in the spring. That's one reason this blog has been a bit quieter of late. Also, I got tired of uploading pictures from holidays (Italy, Paris, London) so I've decided to just not worry about it for now. I'll get them all up eventually.